Fudgy, Dense Brownies Layered with a Sweet Cream Cheese Coconut Topping, Crunchy Roasted Almonds, and a Smooth Chocolate Glaze. 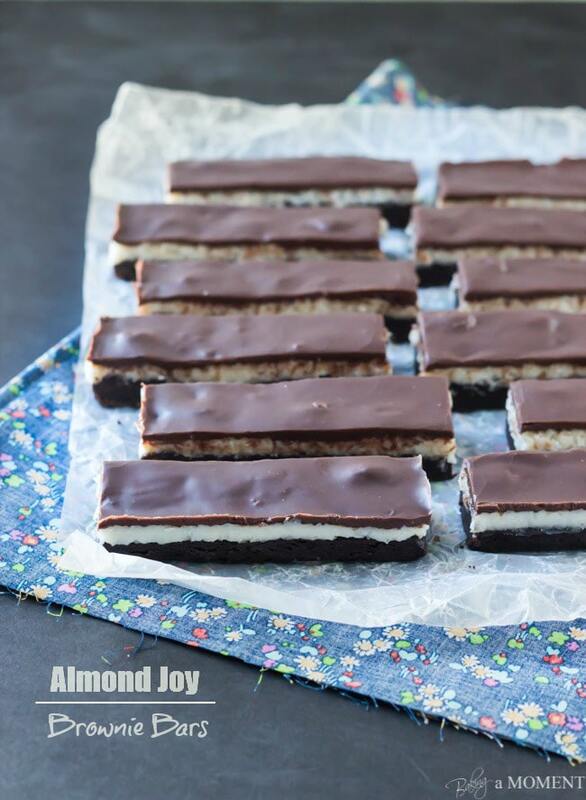 These Almond Joy Inspired Bars might change your mind about coconut! Omg you guys. The craziest thing is happening to me! Wha??? How did that happen? Is that even possible? Seriously, how can somebody go from being a coconut hater for nearly 40 years, to a coconut lover, almost overnight??? These bars definitely played a key role. Really, it began for me with coconut milk. After having it in Thai curry, I had no trouble deciding that the flavor of coconut is woooonderful, but maybe it was just the texture I had been hating for all my life. Anyhow, back to the bars, and my complete coconut 180. Mr. Allie loves coconut and has always wished for me to make more coconut desserts. I did intend to do this before Easter, but I had so many coconut ideas I didn’t know which one to try first. I settled on a coconut ice cream cake for Passover, which I made by layering Luna & Larry’s Coconut Bliss Naked Coconut Milk ice cream between layers of almond dacquoise. Then I topped it with a chocolate glaze which was delicious but extremely sloppy and not blog-post-worthy. I would love to share the recipe with you at some point, because: A) it was the bomb, and B) it was gluten and dairy free. But I need to tweak/perfect it a bit so it looks as good as it tastes. The ice cream totally made it! This coconut ice cream is so unbelievably creamy, and the flavor is outta this world, but it did have little bits of coconut meat running throughout. Which I thought I didn’t like, but the more I licked it off my fingers, the less I minded it. Fast forward to two weeks later, when I’m finally getting around to using the bag of sweetened grated coconut I had purchased back when I didn’t know which coconut direction to go in. I’m whipping the coconut into soft cream cheese + vanilla extract, tasting for sweetness, and having a complete coconut epiphany. Cue the choir of angels! Hallelujah, and praise be to coconut! This is an easy recipe that just begins with your favorite brownie recipe. Do you have a favorite brownie recipe? You know I do. It’s dense and fudgy and extremely dark-chocolatey. You’ll only need one bowl and no mixer, and it’s completely made from scratch, with pantry staples. It’s one of the most popular recipes on this blog! If you don’t already have a box in your cupboard, or an old standby recipe, I think you’ll really like this one! Once the brownies are all baked up and cooled, just top them with this infamous coconut cream mixture. It’s so good! …and drizzle on the chocolate glaze. I find that everything cuts really nice and clean if it’s chilled in the fridge for a few hours. And I really like this kind of knife. I run it under hot water after every cut, and it glides right through the snappy chocolate coating without cracking it. Place the coconut, cream cheese, cream, sugar, and vanilla in a bowl and stir to combine. 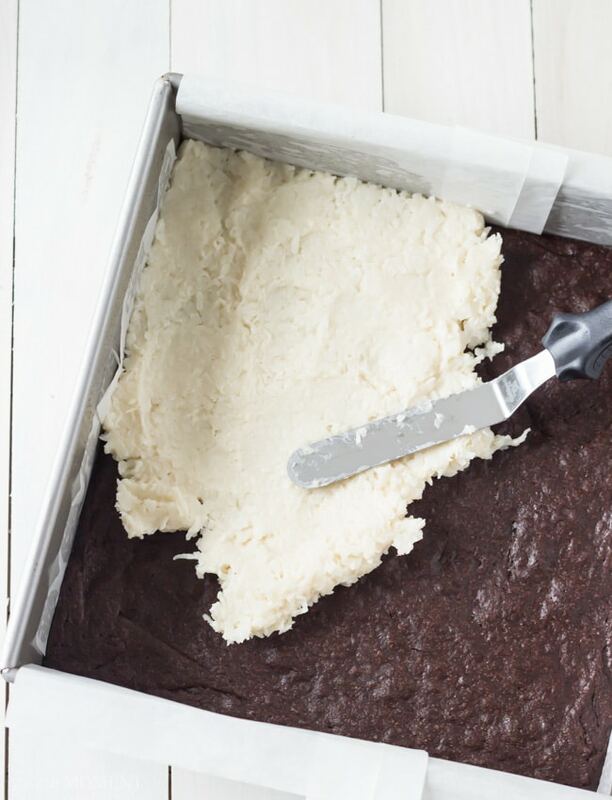 Spread an even layer of the coconut mixture all over the surface of the cooled brownies. 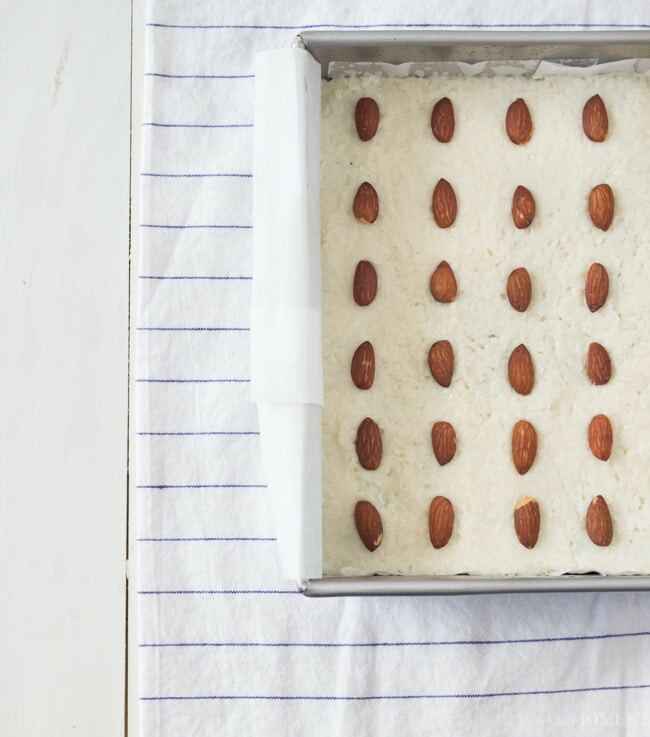 Press almonds over the surface, spacing them out evenly. Place the chocolate and half & half in a small bowl and microwave until the cream is hot and the chocolate is beginning to melt. Stir until smooth. Mix in the powdered sugar and pour over the coconut and almonds. Shake the pan to level/smooth the glaze, and chill in the refrigerator, preferably overnight. Cut into bars using a hot bench knife. How do you feel about coconut? Are you a hater or a lover? Maybe if you’re a hater this recipe could convert you! All that chocolate and cream cheesy goodness, the salty roasted almonds, and that sunny tropical flavor… I only wish I had made these sooner! Allie, can’t believe you are a coconut lover now! And besides, coconut is an all year long treat for me… goes with a lot of goodies! Pinning the coconut goodies! PS… your pictures look so pretty, as always! But, I love how you styled these pretties! I’m definitely in the coconut-lovers’ camp, Allie. My husband doesn’t like it at all but I have been able to win him over with one or two coconut-containing recipes. I think this would be one of those winning recipes, too! I can almost taste that gooey deliciousness! Keep at him, Helen! I’m proof that coconut haters can come around. These bars are so gooey and chocolatey, I’m sure they’d change his mind! I just finished dinner and am not even hungry! Looking for a reason to make this, my tight-fitting spring wardrobe tells me I should wait until I have someone to share them with besides just the hubby! THANKS for another tempting looking dessert! Ha ha, I hear ya, Rachel! Time to take those winter pounds off, for me too! Luckily I had lots of people to share these with and they’re already nearly gone. Hopefully you’ll get invited to a barbecue or something so you can make them. They’re really good! I was the same way! I was all “I don’t like coconut” and…uh…now I do. 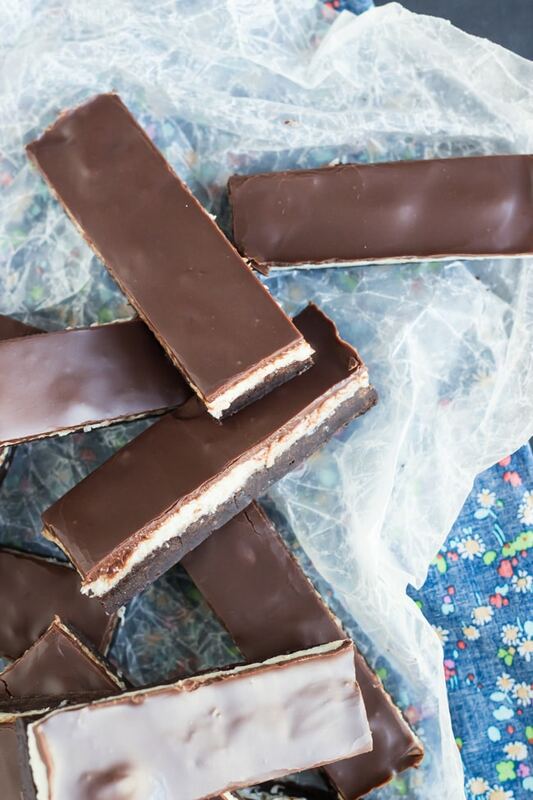 These bars look so insanely delicious-I love all the layers of tastiness! 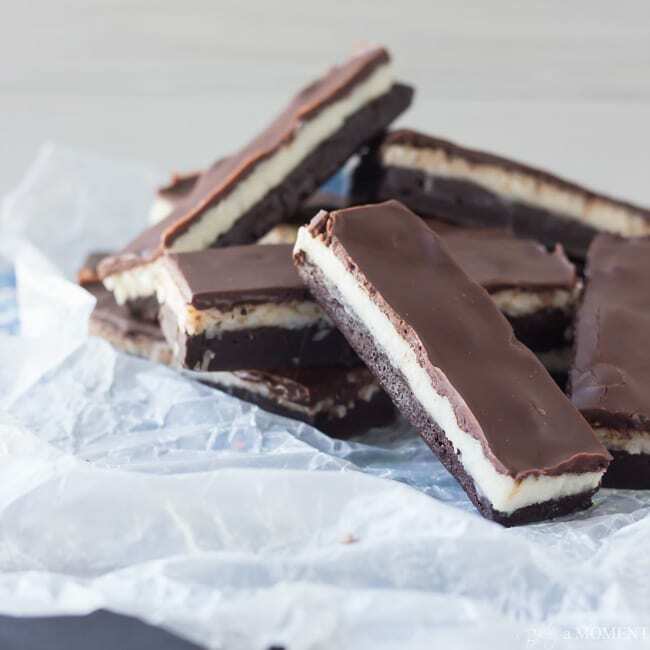 I am 100 percent a chocolate and coconut lover, so um yeah, I NEED to get these bars in my life! Oh ya, if you like coconut then I’m pretty sure you’d love these! They are super gooey and chocolatey and coconutty. Happy Friday, Stephanie! Okay so I hate Almond Joy and Mounds and basically every coconut candy BUT…BUT…THIS…sounds absolutely amazing. Like, I am about to get up right now and go make them because these pictures are super tempting! I’m in the same boat as you, Allie. I used to hate coconut, but now I can’t get enough of it. Or enough of these bars! Coconut and brownies sound like a fabulous combo. I don;’t even like Almond Joy but this looks amazing! These bars sound amazing- I’ve never heard of almond joy before- but I think we have the same thing here called bounty. Definitely a recipe to try out! Yes! I’ve heard of Bounty over in the U.K. and I do think it’s the same thing. Coconut, almonds, and chocolate, right? I hope you do give it a try, these bars are outrageous! Happy Friday, sweetie! These were definitely more chocolatey than coconutty, so they might be right up your alley, Jamie! The cream cheese was really good too- I mean, when isn’t cream cheese good, lol! Thanks so much for reading and for the sweet comment! I wasn’t a huge coconut fan growing up either, but in the past five years or so, I can’t get enough! I literally want to put coconut milk, coconut flakes, coconut anything in everything I make. These bars look crazy good! Coconut is a year round flavor for me 😉 Almond Joy is my favorite candy, brownies are my favorite dessert, basically, why hasn’t this happened in my world yet?! Love love LOVE this recipe, Ally! So thick and rich and chocolatey! Pinned! These are literally the best brownie bars I have ever seen. Love the addition of Almond Joy, my favorite candy bar. Your pictures and styling are really great here, so happy I found your blog. Happy Friday! Dessert doesn’t get any better than this, Almond Joys are my fave!! Oh I’m so happy to hear that, Sue! Thanks so much for reading and for the great feedback. Hope you’re having a fun weekend! Oh Allie, how could you not like coconut? I’m glad that’s been rectified since, to me, it’s criminal. 😆 Definitely safe to say I’m a coconut lover. I keep hearing about these Almond Joy bars. We don’t have them here (boohoo). So, the only thing I can compare them to is a Bounty (same as Mounds there, I believe), but with a hint of almond flavour too? Thank you Lisa! I’ve been missing you too, and I’m so glad to be seeing you around again. I’m so happy you liked the post, my friend! And so happy to be able to join the coconut club 😉 You are right, Almond Joy is just like a Bounty, only with whole roasted almonds on top. It’s a very polarizing candy bar, lol- people seem to either love it or hate it. Hope you’re having a great week, dear! You don’t have to convince me. I already love coconut!! And I love it even more in these yummy looking bars!! MMMMmmmmmm!!!!!! I’m so glad you like it, Renee! These bars made a coconut lover out of me, and they didn’t last very long around here, lol! Allie, these look insanely delicious!! 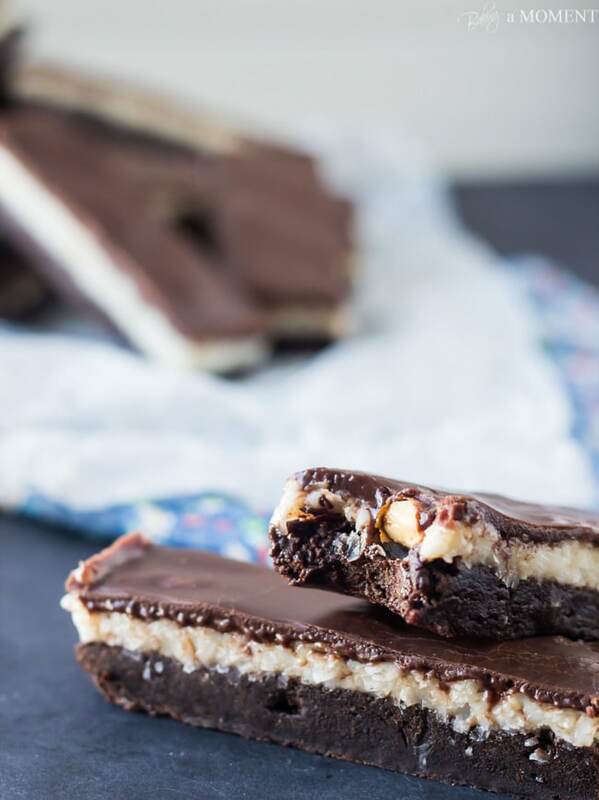 What a great idea – I loooove Almond Joy candy bars, and I think I would like these brownies even more! I’m so glad you like coconut now!! 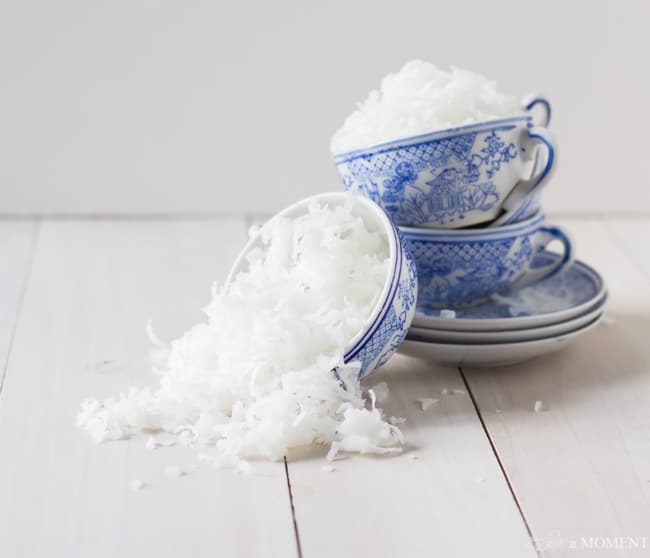 My husband was the same as you – he didn’t like coconut but then realized it is just the texture of shredded coconut that he doesn’t like! These look divine. I was always the only one around who actually liked Almond Joys–more for me, ya know? Ha ha, thanks Danguole! I’m happy to be the newest member of the club. Thanks for stopping by, and for saying hello! Good to know, good to know! Ok so then you’ll be seeing more coconut recipes from me then 😉 Thanks so much for the awesome compliments, girl. Hope your week is off to a terrific start! I totally feel your pain when it comes to coconut! I used to not want to touch it with a ten foot pole but it turns out that it’s all in the way you prepare it. I can’t think of a more delicious way to eat it than these bars! I’m so glad that your taste buds decided to change their mind! Coconut is one of my favorite flavors. And I can never pass up a treat that combines coconut and chocolate. I hope you had a wonderful weekend, Allie! Oh Allie, you’ve got my wanting a bounty bar, their very similar to your almond joys. This bar looks delicious with a capital D!! 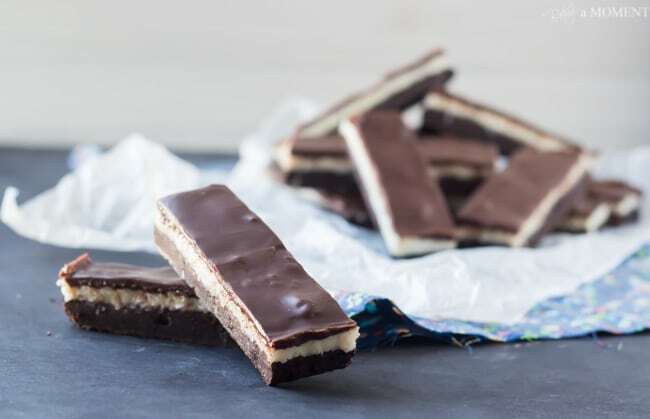 Coconut is a year-round obsession for me just as these bars are sure to become 🙂 Love the brownie base – so decadent! Pinned and shared on FB! Thanks so much, Trish! I’m so happy you liked it so much. Now I can’t wait to come up with more coconutty desserts 😉 Hugs to you, friend! I’m thrilled that you joined the coconut bandwagon. It’s a great place to be! I’ve always been a coconut lover. These look delish indeed! I just need you to follow the board in order to send the invite. Thanks! Oops, sorry about that! I didn’t realize I wasn’t already following. Done! Allie, I used to hate coconut too but I’m a total convert. I love the stuff, can’t get enough. I love putting it in everything – loaves, muffins, cakes, cookies. Delish. 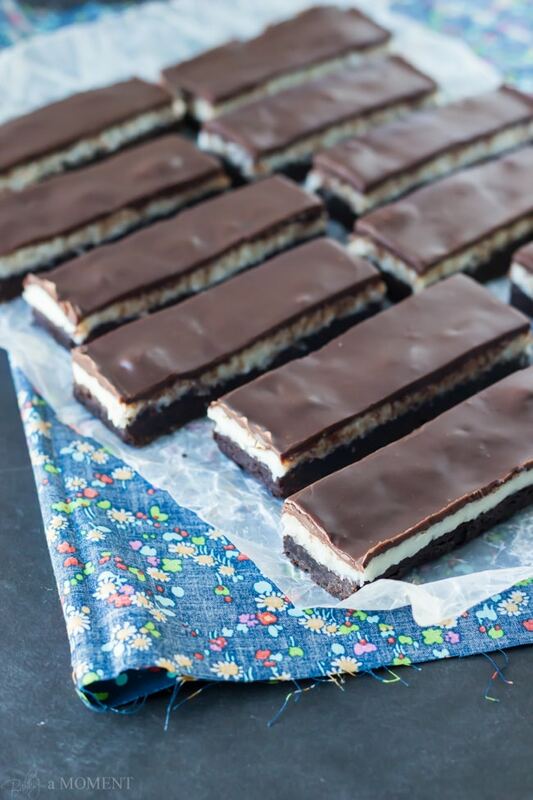 And these almond joy bars are beyond amazing. They look fantastic, girl, and your photos as always are gorgeous. How do you cut such straight lines?! I’m terrible at it. Even with a super sharp knife dunked into boiling water, my bars are always crooked and wonky looking. Everything about these bars is perfection! OMG! These are absolutely beautiful, and your photos … oh my! Just gorgeous. The BF would love these guys, so maybe I should hide the recipe for the time being. 😉 I hope you are having a fabulous week, Allie! Hi Allie, just wanted to let you know that I included your recipe in a chocolate round-up on my blog today! Thanks for linking up such an incredible recipe to the weekend re-Treat link party! Yay! Thank you so much, Britni! I love the Weekend re-Treat; thanks so much for hosting it every week, and for the feature! Chewy bars are the best! That final photo with the bite missing makes me want to run to the kitchen and make these immediately….actually, I might do that! These look amazing! I will have to make these for my coconut loving husband (yeah, and me too)! What if you’re a complete cream cheese hater? Is there any other mixture that coconut could be added to for this? I would make these for my dad (who would eat the cream cheese) but I cannot stomach it and I’d love to be able to try these too. Hm, that’s a toughie! Can you stomach mascarpone? That would give a similar texture but with less tanginess. Another option would be to use a buttercream frosting, but that would obviously be a lot sweeter.